Eli is going to be a big brother!!! We are so excited to welcome baby tree #2 to the family and watch Eli become a big brother! I am due April 7th, which means I am 10 weeks. 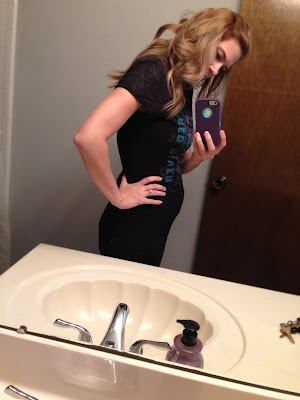 This pregnancy has been extremely different from my pregnancy with Eli (so far). With Eli I never felt pregnant and breezed through the first trimester. I *thought* I had feelings of sickness with Eli but nothing big. Whoa. I did not know what pregnancy sickness was. I now do. I have been nauseous 24/7 with occasional sickness. Some women have it so much worse so I've tried not to complain too much (I'm sure Luke just laughed out loud while reading that) but man I'm ready for food to taste good again! Eli has been so good. There have been a couple of days where we haven't left the house because I feel so bad, but he just rolls with the punches and is always right by me, whether I'm sick or not. One day while playing with friends I watched Eli mock throwing up to his friends. That was a wonderful experience. I've always heard that with the second baby you show a lot sooner and that seems to be true. Even though I've been sick and haven't been eating as much I have still managed to gain weight. I think I'm one of those people that just gains weight really easily while pregnant. At least that's what I'll tell the doctor. I'm only 10 weeks and I already have belly. I'm not saying it's huge or anything, I'm just shocked that it's already forming. I will be doing pregnancy updates again. Luke has already tried to get out of taking my picture, sorry buddy. I still love going back and looking at my updates with Eli and reading them. I know I will want to do the same with this baby. So that's our big news!! It's always hard keeping such a big secret! Thank you so much for all the congrats and excitement! It's so fun to have others join in our big excitement! We are so thankful for this new baby and this new journey for our family! Yay! Congratulations! You look great! so exciting! Congrats!! :) I had that 24 hr sickness through my entire pregnancy with Kennedy so I know EXACTLY what you're feeling right now. Hang in there! Congrats! I'm so excited for y'all!! Congrats! I'm having #2 tomorrow!!! Ahh - what a cute baby bump already... so exciting! Congrats to you! You look adorable with that little bump! Baby number 2 always makes life more lively, but they are so much fun! Congratulations, Mama!! So happy for you all! Praying for a healthy and happy pregnancy. Also, Eli looks just like you in that picture. XOXO. congrats girl! what exciting new for your new family of 4! 8th week. She's tiny like you and has already grown a good size belly. The next few months will be interesting! Sounds like it must be a girl :) I am sick 24/7 for MONTHHHHSSSS with both my girls so whenever I hear someone is sick, sick, sick then I always predict GIRL. haha. YAY! Soo Soo excited for you!!! That's great news! Congratulations :) hope u feel better soon too! Congrats!!! I hope you start feeling better quickly!!! Congratulations! I hope you start to feel better soon! Awesome! Congrats! I'm pregnant with our 2nd as well & due March 12th! I was wondering if your lack of posts was baby related...I've been struggling with my blog b/c I've been really sick and have baby on the brain. Congrats again! I am so thrilled for you :) Sorry you've been sick....hopefully it will all be gone by the 2nd trimester! Love love love everything about this post!!! Sooooo happy for all of you!!!! Congrats! I was reading your blog the other day and started wondering when baby #2 would come along. This is such great news! I am so excited for y'all! I've never commented on your blog before (I don' think) but have read since right around when you had Eli. I randomly was wondering the other day when you would be pregnant again because Eli is getting older and I just figured it would be soon. Kind of embarrassing to admit I was thinking about you in my spare time, haha. But congrats! Congratulations!! That is sooooo exciting! Best wishes for a smooth pregnancy! Congratulations to you and your familoy! Congratulations! You should look for ginger capsules. My doctor just recommended them to me and I am really hoping they will help. It can be miserable, right?! YAY! CONGRATULATIONS. What an exciting time!